Strict inerrancy is a belief and a doctrinal holding that states that the Bible is without error in its present form. This belief stands in opposition to the doctrine of original inerrancy, which holds merely that the Bible might originally have been without error but now contains a few minor errors from copying. Strict inerrancy does not mean that any given translation of the Bible is inerrant. It means, rather, that we have manuscripts of the Bible, in its original language, that preserve intact the original God-inspired text. To understand why strict inerrancy is so important, one must consider what the Bible purports to be. Believers in the God of Abraham, Isaac, and Jacob also believe the Bible to be the direct Word of God. The principles of Biblical inerrancy derive mainly from the Bible's astonishing prophetic accuracy. To name the most famous example, the Bible contains over four hundred specific prophecies about Jesus Christ. Peter W. Stoner recently calculated that the probability of even forty-eight of them coming true by chance alone was 10-157. That's a digit one, preceded by 156 zeroes and a decimal point—or one ten-thousand-quinquagintillionth. To put that in perspective, ten thousand quinquagintillion is one-tenth of the square of the total number of electrons in the universe. Strict-inerrantists firmly believe that a God capable of keeping a Promise against odds of ten thousand quinquagintillion to one is certainly capable of preserving intact His Original Words, regardless of any man's careless or even any man's attempted interference. To suggest otherwise—to suggest, in sum, that God would allow careless or malicious human beings to tamper with His Word—is to violate the very character of God. By far the most remarkable attestation for both the prophetic power and the accuracy of transmission of the Bible occurred in 1947, with the finding in Qumran of the Dead Sea Scrolls. Those documents, which actually date as far back as 600 BC in some cases, agree word-for-word with modern Hebrew manuscripts with very few exceptions. The New Testament was less well-protected. However, Williams reports that more than 24,000 copies of the New Testament exist, the oldest of which date to within 25 years of the writing of the last Book of the Bible (Revelation). Those copies have an enviable record of agreement among themselves, having 40 disputed lines, as compared to 764 disputed lines in the 643 copies of the Iliad of Homer. The doctrine of strict inerrancy derives from a consideration of the character of God and also is very well supported. Strict inerrancy also provides a testament to the reality of the Creation story, and the absolute reliability of God's Promises to those who believe in Him. Original inerrancy is a belief that, while the Bible was without error in its original form, its present form contains an unavoidable number of copying and other errors. Transmission is the copying of the original manuscript, in the original language. Translation is the rendition of the manuscript from its original Hebrew (or Greek) to another language. 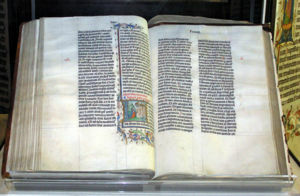 A few commentators have taken a position that one translation or another is as reliable as were the original manuscripts. The "King James Only" movement is a prime example. Critics point out that translation is never exact, and that to assume that a given translation would be just as inspired, or "God-breathed," as was the original is to assume a doctrine that Scripture does not itself hold. Transmission is another matter. An original inerrantist simply says that we do not have the original manuscripts, and should never accept a copy in lieu of an original. Strict inerrantists respond by pointing out the great care that the transmitters of the manuscripts have taken, and the remarkable correlation—better than that of copies of any other ancient work—between and among known copies of the Bible and its various books. Substantive accuracy is the view that the scriptures were written by wise and intelligent men who either observed the things they recorded, or based their accounts on reliable and accurate sources. This view is based primarily on the literary characteristics of the Bible and its consistency with the physical evidence. The minor contradictions and errors are seen as adding to the credibility of the Bible, as evidence that it must have originated from independent sources, thus making the remarkable consistency throughout that much more striking. For example, a person holding to this viewpoint examines the four accounts of Jesus's resurrection, notices the differences, and admits that they may very well be incompatible. However, the fact that the four accounts are slightly different is then taken as evidence that the accounts originated separately, rather than originating from a single source. The fact that there are four independent historical accounts of the event which are so similar in all the significant details is then seen as strong evidence that the event as generally described actually occurred. Consequently, those holding this viewpoint generally have little to argue about with those subscribing to Biblical inerrancy on any substantive matter. They believe that the Bible is accurate in its description of the creation and events that followed. They only contest the belief that the Bible is completely inerrant, because they see no reason to believe this, either from any claim to inerrancy on the part of the Bible, or by a simple glance at several facts which they consider to be obvious but minor errors and contradictions. It is argued that while scripture is indeed God-breathed and useful as this passage says, there is no reason to conclude from this verse that the Bible is inerrant. Adam was literally God-breathed, but he made mistakes. Why should being "God breathed" mean being without error? And if the author of this verse intended us to believe that the Bible was without error, why didn't he say so? The Bible is not seen as the "Word of God." Jesus alone is seen as the word of God, for He is the only One called the Word of God in scripture itself. The Bible is seen as a book written by wise and inspired men of God who experienced and understood the Word of God through the prophets and through Christ himself. Skeptical empiricism: The belief that nothing should be believed unless it can be seen or "reasonably believed," in concert with a skepticism toward God and miracles. Example: Hume. Religious empiricism: The belief that nothing should be believed unless it can be seen or reasonably inferred, in concert with an openness toward God and miracles. Example: Aquinas. Fundamentalism: The belief that true understanding must begin with the acceptance of biblical and theological principles, and that science and empiricism are doomed to failure, because they do not rest on this first principle. Fideism: The belief that religious dogmas can and must be believed "by faith," without evidence. Example: Kirkegaard. ↑ Stoner, Peter W., and Newman, Robert C. Science Speaks: Scientific Proof of the Accuracy of Prophecy and the Bible, online ed. November 2005. Accessed October 11, 2008. ↑ Slick, Matt. "Prophecy, the Bible, and Jesus." Christian Apologetics and Research Ministry, January 2002. Accessed October 11, 2008. This page was last modified on 10 June 2015, at 16:56.